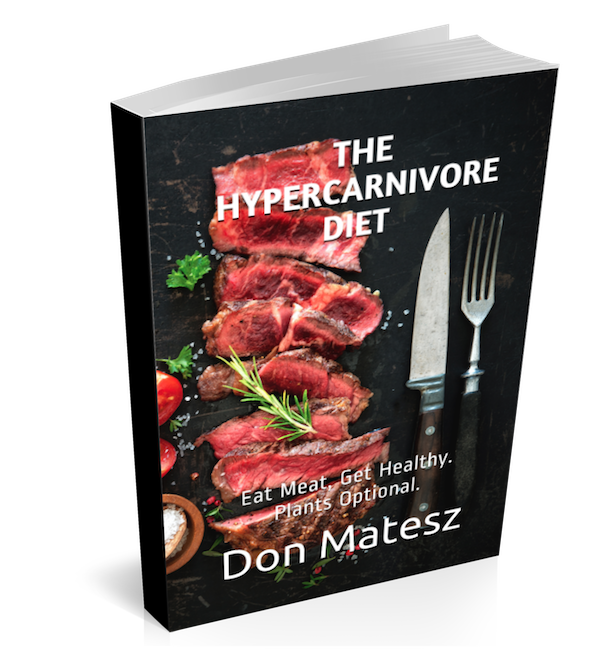 The Hypercarnivore Diet provides evidence and logic supporting the radical notion that we are designed by Nature to obtain at least 70% of our nutrition from meat and fat, with very little or no plant foods. With hundreds of references to basic science textbooks and studies of human anatomy, physiology, biochemistry and nutrition, it shows that we require an animal-based diet to maintain health and fitness and whole plant foods are unimportant and potentially hazardous to health. Over 40 years of experimenting with diet, I have eaten many variations of plant based diets, including lacto-ovo vegetarian, whole foods omnivore, macrobiotic, paleo, and strictly whole foods vegan. In 2011 I adopted a whole foods plant-based vegan diet and continued that for more than 5.5 years, during which my health and vitality declined along with my serum cholesterol. In late 2016, while still on that diet, I had a blood test which showed I had low globulin, a sign of protein deficiency, and low phosphorus, indicating dietary phosphorus and vitamin D deficiency. I started adding small amounts of animal products back to my diet in March of 2017. I continued eating a whole foods plant based diet, but with some animal products added, until May of 2017, when I adopted a hypercarnivore diet. Almost all of my dietary experimentation was aimed at reducing, reversing and recovering from seasonal allergies, dermatitis and psoriasis, which I have had in some form for as long as I can remember. So long as I ate plant based diets, the conditions did not improve or got worse, unless I used medication (either pharmaceutical or herbal). During the last year or so of the 5+ years that I ate a whole foods plant based vegan diet my psoriasis and dermatitis got markedly worse and started spreading. In Spring of 2017 I read a post on ZeroCarbZen.com by Candi Leftwich, who reported obtaining almost complete relief from Crohn’s disease and psoriasis by eating only meat, fat and water for 3 months. At that point I realized that I had tried to heal my condition by restricting animal foods and eating whole plant foods for nearly 40 years, but I had never tried severely restricting plant foods for any length of time. So I decided I needed to try a highly carnivorous diet to heal my skin. No more bloating, flatulence, or loose, explosive stools. Although it took almost 6 months for my bowels to adapt to the elimination of fiber, now my bowel function is better than ever so far as I can remember. Healing of a knee injury that would not fully heal when eating a plant based diet. Improved overall skin quality (better moisture without needing to apply lotion). For example, for as long as I can remember before carnviore my elbows were always dry and rough. Now they are smooth and soft. Reduced fat mass. Reduced my waist circumference to what it was when I was in high school. This had been impossible on every plant based diet I tried. Improved muscle mass and strength compared to highly plant based diets. Far more satisfied with meals. No longer looking for “something” after stuffing myself full of plants. Greater tolerance for heavy labor/training and quicker recovery. Less frequent need to eat. Almost never need to eat more than two meals in a day, and some days can eat just one large meal a day and be done. Meal preparation is easier and less time consuming. Shopping for food is easier and less time consuming. 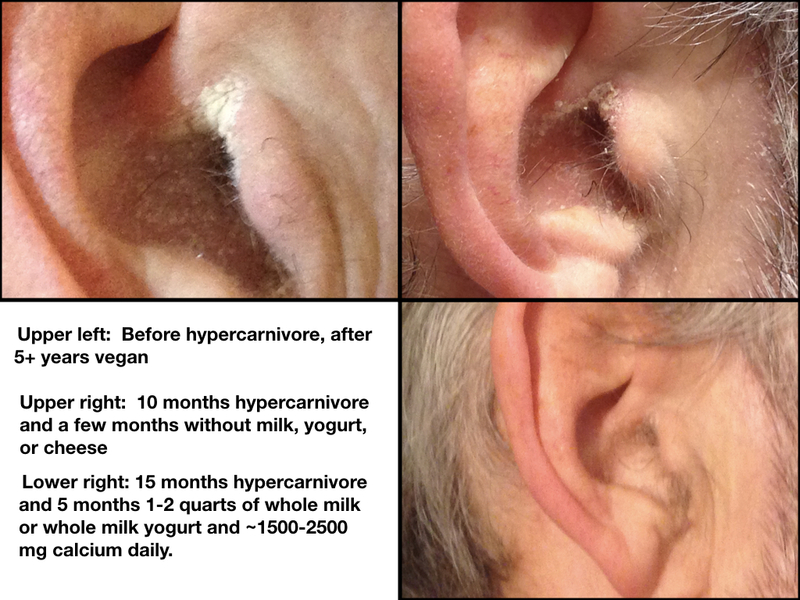 The story of how I came to the hypercarnivore diet after more than 40 years eating and promoting diets rich in whole plant foods, including vegetarian and vegan whole foods diets. Click here to download the full text of the Preface. Reviews the evidence indicating that human ancestors and contemporary primitive people were highly carnivorous and largely immune to degenerative diseases affecting modern people. Explains the evolution of health awareness, why blood tests are not necessary to identify health and can mislead us, and major signs of health. Explains why calling any animal an omnivore is scientifically sloppy and enables people to avoid identifying whether an animal is primarily adapted to consuming plants or animals. An extensive review of the evidence indicating that humans are primarily adapted to eating meat and fat. This chapter is more than 70 pages in length and has more than 200 references to scientific books or articles. An extensive review of the evidence indicating that fiber, carbohydrates, fats and phytochemicals in commonly consumed plants can damage the human teeth and digestive tract and have many other deleterious effects. It also includes a section on possible hermetic effects of eating This chapter is 40 pages long and includes more than 90 references to scientific books or articles. Discusses the evidence, published in standard biochemistry textbooks and journals, indicating that fat is the preferred metabolic fuel not only for humans but all other mammals including chimps and gorillas, as well as birds. Discusses the difference between animal and plant fats, and explains why saturated fats are not harmful, and can't be harmful, because Nature has selected them as one of the primary forms of energy storage in all mammals. 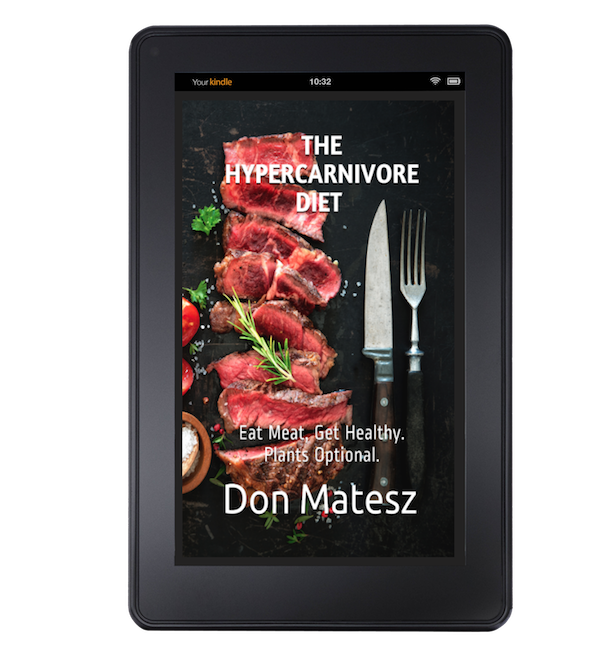 A discussion of the foods included in and excluded from The Hypercarnivore Diet. Foods are divided into Essential & Primary, Optional Animal Foods, Optional Non-Animal Foods, and Avoid/Severely Restrict Foods. 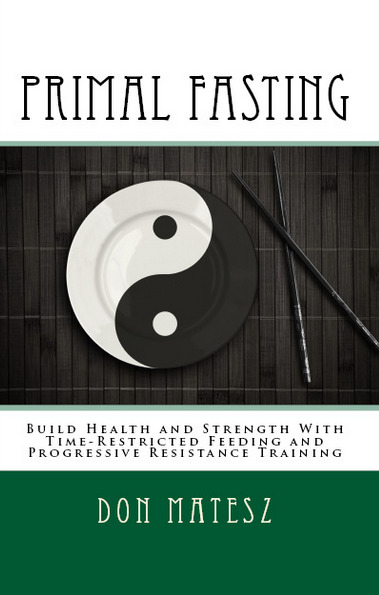 This chapter includes extensive discussion of scientifically estimated maximum protein and fat intakes, potential benefits of including optional dairy products, why some people may want or even need to include some non-animal foods, ranking of optional non-animal foods, what plant foods to studiously avoid and why. Includes suggested starting quantities of meat, fat, and other foods to meet nutrient requirements eating minimal or no plant foods. Extensive discussion of conventional grain-fed animal products in comparison to exclusively grass-fed products. Discusses hormones, antibiotics, chemical and pesticide residues, vitamin and mineral contents, and essential fatty acid contents. Provides evidence (scientific references) indicating that grain-finished conventional animal products are at least as safe to consume as grass-fed, with no hazardous residues, and one can obtain adequate intakes of all essential nutrients including omega-3 fatty acids from grain-finished beef and dairy products. Explains why Nature (natural selection) has favored humans who prefer to cook most of their animal products, and discusses potential benefits of including a small amount of raw animal products in the diet. An extensive discussion of ketosis and high protein intake. Provides evidence and reasoning supporting consumption of a high protein diet according to appetite and satisfaction, as opposed to restricting protein in an attempt to increase ketosis. Issues discussed include the impact of dietary protein on ketosis, protein and fat ratios in diets of wild carnivores (non-human and human), why Nature favor glucogenesis over ketogenesis, fasting blood sugar effects of high protein low carbohydrate diets (based on Inuit data), data casting doubt on the idea that the benefits of ketogenic diets are primarily due to ketosis, dissociation between ketosis and fat loss, how restricting protein can lead to metabolic and hormonal problems (e.g. hypothyroid) due to insufficient amino acid availability, and evidence that very high protein diets suppress cancer growth and favor autophagy. An effort to provide an evolutionary explanation for the dietary divergence between humans and the other great apes, pulling together some data that is ignored by proponents of the idea that humans descended from a frugivorous ancestor significantly similar to modern chimpanzees. This data indicates that the last common ancestor of chimps and humans was not likely similar to the modern chimp. 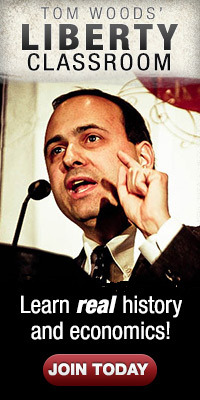 Discusses the environmental impact of eating a meat-based diet versus a modern plant-based diet. Argues that plant-based diets are the primary drivers of environmental stress by route of their effect on human population density and energy consumption in food processing. Answers to some questions I have received. The Hypercarnivore Diet is not an intellectual diet, based on ideology about foods. It is a diet based on human nature. 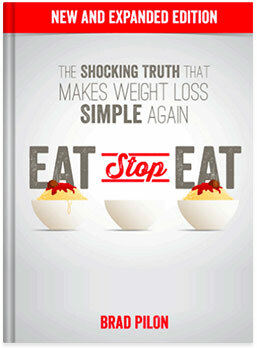 This chapter wraps up the book, asking readers to bypass eating ideology in favor of eating according to biology, using taste, hunger, satisfaction, and other naturally selected biological guides to optimal nutrition instead of concepts such as kcalorie balance, optimal macronutrient ratios, and so on.